Despite the monumental challenge of fixing the woes of the industrial food system, resilient farming expert Laura Lengnick remains hopeful. Laura Lengnick is a big thinker on agriculture and the environment. She has been guided in her work by the understanding that the problems generated by the U.S. industrial food system have been as significant as its ability to produce vast quantities of food. As she sees it, it’s not enough to produce food if there’s not a reckoning of costs and benefits from an unbalanced system. This comprehensive outlook is a hallmark of Lengnick’s work, as is her positive vision for a more equitable and sustainable future. 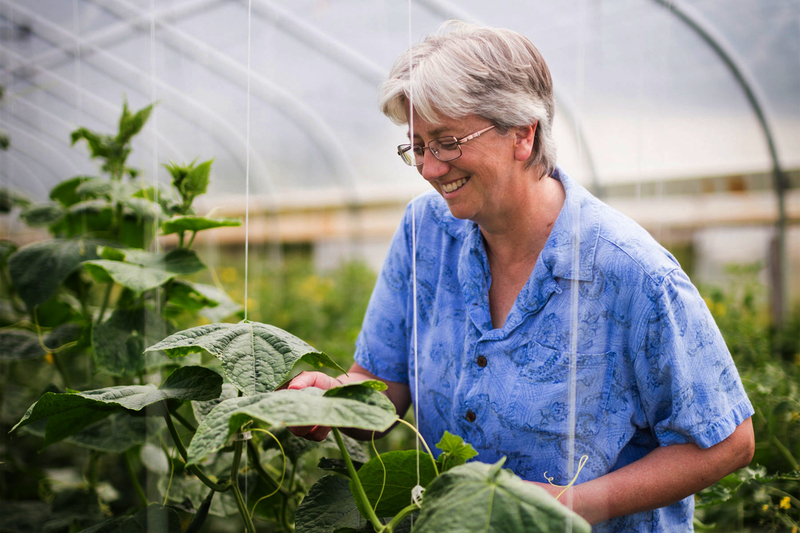 When it comes to her career, the question is not what work Lengnick has done to explore resilient, sustainable agriculture, but what hasn’t she done. Soil scientist, policymaker as a Senate staffer, USDA researcher, professor, sustainability consultant, advocate—Lengnick has done it all. Photo courtesy of Glynwood Farm. Lengnick is the author of many articles and papers for scholars, practitioners and the general public, including the useful and engaging book Resilient Agriculture: Cultivating Food Systems for a Changing Climate. She was also selected as a contributor to the Third National Climate Assessment, the authoritative U.S. climate report. Over the years she’s traveled throughout the United States to meet with farmers to investigate the challenges and successes in the field and present her findings to many different audiences. Most recently, Lengnick has been invited to collaborate with the world-renowned Stockholm Resilience Centre, which will bring her views to an even larger audience. In a series of conversations, Lengnick and I spoke about her background, career, and philosophy to better explain where she is today. Innately curious, Lengnick didn’t start out imagining that she was on the road to food and agriculture—she thought of farming as grueling labor, an upbringing which her grandparents were eager to leave. In college she went into a pre-vet program, then photography and the visual arts. After she entered into landscape architecture and took a soils course, things came together. As she dug into soil science she knew she’d found her calling. After acquiring her degrees in soil science, including a Ph.D., Lengnick was motivated to make an impact. With the passion and knowledge of soils and sustainable agriculture, she turned to a monumental question: How can we feed humanity while maintaining the health of the planet? What she observed was an out-of-whack food system where ever-greater yields and production came at a price to the surrounding environment. From plowing under healthy soils for depleted, monocropped fields to the impairment of clean air and water, she knew the current American agricultural model must do better. To change the scenario, Lengnick went into the policy realm and became a staffer for South Dakota Senator Tom Daschle, a prominent voice on farm and environmental issues, in a role where she worked on soil, water, and wetland conservation programs for farmers. She then moved on to ag research in the USDA, after which she left and spent five years on the outside, lobbying and crafting policy for sustainable ag producers at the federal level. While Lengnick was successful in her efforts at the federal level, she felt the pace of change was too slow, and decided to leave government. It freed her to be a leader for sustainability in the academic and advocacy worlds, where she had more flexibility to address the challenges of the industrial mindset, of which the industrial food system is just one form. What she identified earlier in her career had become even clearer upon further analysis: The industrial food system was simultaneously productive and brittle, and it degraded natural resources and social bonds. Lengnick notes that the industrial system is based on a philosophy that is “laser focus[ed] on technology as being the source of solutions and the source of wealth.” While technological innovation is welcome and necessary to create a good society, the fixation on it is not. This narrow focus perpetuates the concentration of wealth and defines success as the accumulation of material things beyond the point where they retain their value. Despite the monumental challenge of changing the industrial food system, Lengnick is hopeful. She appreciates the technological improvements from the industrial system, but understands that the system is self-limiting and must break out of its constraints to gain the multitude of benefits a diverse ecosystem provides, whether in the natural or human-social spheres. Lengnick says that the existing industrial food system is ensnared in a “lock-in-trap” where agriculture converts to commodity production that overwhelms the healthy functioning of an ecosystem, reduces native plant biodiversity, overuses natural resources, increases pollution, and generally degrades natural and human systems like farm labor, food workers, and personal relationships in the areas where food is grown and served. Resilience—or the ability of a person or system to bounce back withstand a disturbance—is the way forward and offers a set of tools, the “levers of transformation,” that can help farmers, ranchers, producers, and consumers adapt and thrive. In the case of food and ag systems, how farmers overcome extreme events, for example, drought or heat waves, are important to their survival. This is an especially big concern as human populations and prosperity grows, just as the world warms and injects more uncertainty amidst erratic climate events, like heat waves and floods. At this point the U.S. might not be ready for a full-scale shift to resilient food production, but there is a genuine yearning for transformation. Lengnick’s interactions with diverse groups of food-company people and farmers—conventional or sustainable—have been excited to incorporate elements of resilience into practice. Overcoming variability and uncertainty through more resilient, regenerative agricultural practices is slowly seeping into the culture of industrial food and agriculture system, even if it’s not yet mainstream. Farmers and producers want to make sure their land and operations are more resilient, but the first thing to consider is that they run businesses. To get interest you have to show that “[r]elatively simple changes to operations that are going to reduce cost because conventional farmers profit margins are, for a lot of them, nonexistent, and for many of them very thin…and what I hear from farmers is that they can’t justify experimenting with practices that are going to cost more money,” says Lengnick. Lengnick emphasizes that farmers constantly strive to build adaptive capacity, a primary component of resilience, but industrial agriculture’s short-term incentives can lead to short-term thinking that hinders experimentation and place-based adaptation. Some groups like the National Farmers Union are meeting the climate challenge head on with practical guidance, like in their What Can Farmers Do About Climate Change? series, to which Lengnick contributed stories about dynamic cropping—or rotating crops to adapt to specific conditions—as part of a regenerative system. Many farmers are also interested in or pursuing other sustainable practices such as low or no-till, soil amendments and composting, efficient irrigation, permaculture and more. Part of the shift towards resilience is finding the right scale—or distance between locations—for food production and consumption. In Lengnick’s assessment, the regional level is the most suitable, in a unit she calls the Metropolitan Foodshed, which she’s written about in detail. Breaking the industrial food paradigm to focus on a more regional scale can offer benefits and greater resilience while still supporting a vibrant and diverse food economy. While it might seem implausible if not impossible to imagine food systems that aren’t driven by short-term thinking and instead produce healthy food for healthy communities all within a healthy environment, that’s just what’s needed if it’s ever to happen. Lengnick emphasizes the necessity of articulating a positive vision to create the future that’s desired, to create a new food paradigm. In that way, shared values can be assembled within the communities that will do the actual work. This builds social cohesion that can then connect with the cultural understanding and practices that the local (or regional) community already knows and values. That means working with knowledge and social bonds that are embedded in the community rather than blowing it up. It also means that eaters must also be involved—which really means everyone—because their everyday food decisions send market signals to food companies and farmers. Additionally, public pressure focused on producers and policymakers can motivate them to institute incentives that promote long-term thinking and create more resilience and sustainability in food systems. Above all, Lengnick has been steadily working throughout her career to help others see the big picture, to grab hold of the levers of transformation and join together to build a better future that they’ve always imagined. This post originally appeared in Ecocentric, and is reprinted with permission. Good to read of someone thinking. Holistic thinking and management , particularly grazing is another part, especially for increasing soil carbon. I wondered what happened to you after I left NC State This article is wonderful. Please say you remember me. I agree totally with you. My compliments for your commitment to this important cause. This is really inspiring. I run a small urban farm in Columbus, OH and constantly wonder what, if any impact, I'm making on the BIG picture. I look forward to reading more from Lengnick and learning from her new and better ways to understand and articulate my vision and objectives.